EDITORS NOTE: I am traveling the Pacific Northwest, so today’s daily newsletter comes from our friends at Power Profit Trades. I hope you enjoy their content. I want to talk to you about something Wall Street has been lying to you about for years – options. Now most of the billionaires and hedge fund managers on Wall Street want you to believe they’re too risky, too complicated, and simply not worth your time. And they continue putting this kind of fake news out there so you keep dumping the money you’ve been slaving away for while they take all the profits. In fact, the last thing they’d ever want the average investor to know is the truth about the kind of income you can bring in – with little effort and even less risk. Google is currently ranked second on Forbes’ world’s most valuable brands for the eighth consecutive year, sitting at a market cap of over $778 billion. It’s also among the world’s most expensive stocks, trading at over $1,114 per share as I’m writing. That means you’d need to have a cool $1,114 on hand to add one, single share of this stock to your portfolio. For many hardworking people out there, that’s more than two weeks’ of pay. And what’s worse, 100% of that cash would be left at the mercy of the market – which is exactly what the Wall Street guys I mentioned above want you to do. That’s the kind of thinking – and the kind of greed – that helped lead to the Great Recession of 2008. And you shouldn’t be on the line for some fat cat’s private yacht while they’re gambling your money away. So I sent a recommendation to my subscribers to open a call spread, or what I like to call a “Green Loophole Trade,” using the GOOGL July 20, 2018 $1170 call options and $1180 call options. When opening a spread trade, you’re both buying-to-open and selling-to-open call or put options with the same expiration date but different strike prices, simultaneously, on one order ticket. 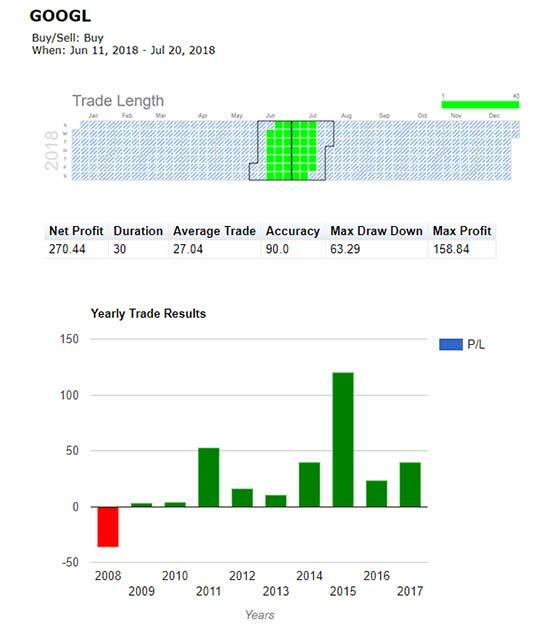 In this case, we bought-to-open the July 20, 2018 $1170 calls and sold-to-open the July 20, 2018 $1180 calls at the same time, as one order. And it only cost us $317 to buy 100 shares of the stock (one options contract is equivalent to 100 shares). That’s over 28,356% LESS than buying 100 individual shares of the stock outright – and partially why Wall Street doesn’t want you trading options. Just nine days later, and as my Money Calendar predicted, GOOGL jumped 3.5%, driving the price of our options to $6.57 – a 107.26% gain. And mind you… we only paid $317 to make a triple-digit profit – on roughly a 3 ½% stock move. That’s the kind of money that’s easy to make ANYTIME using options – and the kind of money the Wall Street billionaires and hedge fund managers have been hiding for years. Now at the time, the stock itself was trading right at $1,585.46. So imagine trying to get your hands on 100 shares of it. 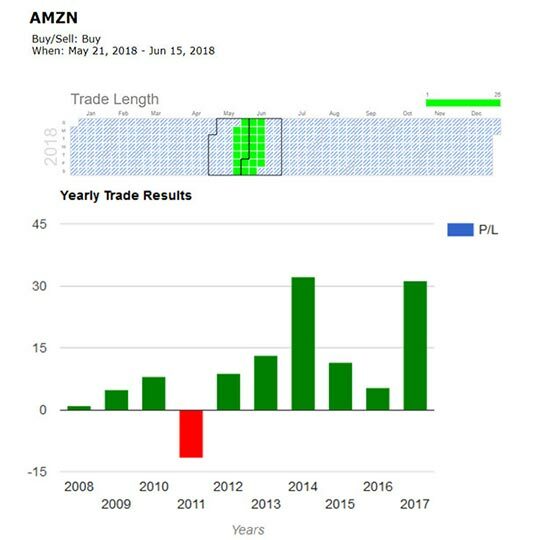 You would’ve needed $158,546 laying around to dump into AMZN – and would’ve needed to cross your fingers, hoping for the best. My members only had to pay $425 for 100 shares – over a 168% discount. And exactly two weeks later, we pocketed a 101.65% win. And two days after that, we scored another, even bigger win – 121.18% gains – on the same spread. But if you did fork out thousands of dollars buying individual shares of the stock, you would’ve only made a 5.03% on your return. That’s why it’s almost laughable to see all of the lies and misinformation out there about options. They offer an amazing versatility that you can use in a variety of ways to profit from a rise or fall in the underlying market. And in times of high volatility (like right now), they’re a welcome relief from the uncertainties of traditional investing methods. Folks, this is just one example of how my precise strategy can turn into huge profits. Now, since this exact strategy has seen so much success this year, I want to make sure you have special access. Click here to learn how you can gain yours today – and be ready for the next lucrative opportunity. Is Japan Adding Fuel To Their Economy or To The Fire? Will Costco (COST) Earnings Beat Estimates this Season?